It was the dawn of 13th July, 2013. As planned Abhash, Ninad, Atul met me at Dadar station at 6.15 AM. Bhavesh, Suresh and Manoj were supposed to board the local train from Mankhurd station. Tarun called us to inform that he will be joining us at Nerul station. Everything went as per our timetable and all were in the same train. We reached Panvel (पनवेल) station at 7.30 AM after having boarded the 6.35 AM local from Kurla station. 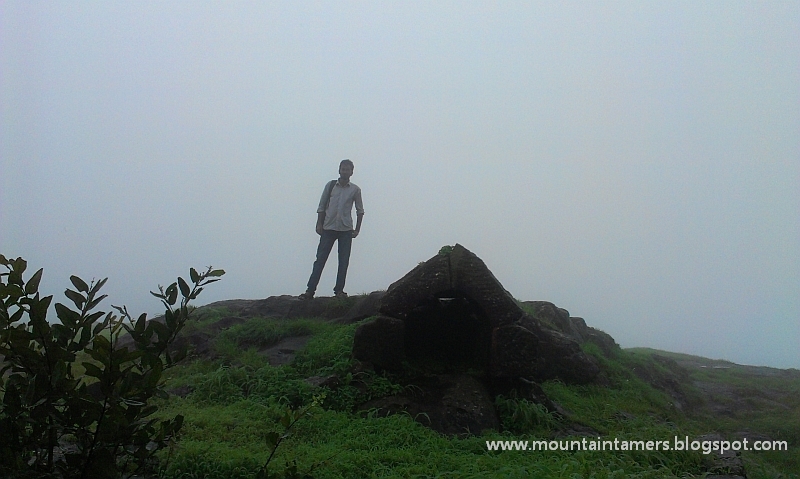 Note: Before you start, check out my latest visit to Manikgad too. It has lot of info which I couldn't cover here. Click here. We walked to Panvel ST bus stop, which falls at a distance of 10/15 minutes. 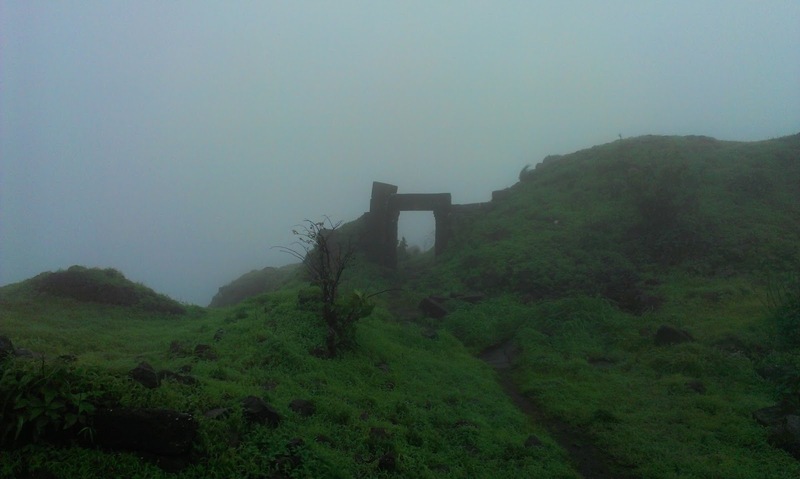 The trek to Manikgad (माणिकगड) fort begins form Washivali (वाशिवली) village. We boarded the 7.45 AM ST bus to Lohop village (लोहोप), a village after Washivali. The bus was crowded but still we managed to find ourselves some seats. The bus left as per the scheduled time. The charges till Washivali were 20 ₹ per head. When we were outside the Panvel city the bus broke down, unable to start again. Luckily there was another ST bus behind us, but sadly it was going to some different village. It dropped us at a junction named Siddheshvar (सिद्धेश्वर), from which Washivali village falls at a distance of 20 minutes. From there we boarded an Auto that took us to Washivali village for 10 ₹ per seat. From Washivali, two routes originate from the main road. The first right proceeds via Katarwadi (कातरवाडी). The second right goes via Dhangarwadi (धनगरवाडी). Then both routes meet ahead after about an hour. We took the second route. We started towards Vadgaon (वडगाव) village. We came across a big temple (to our right hand side), and we took a right turn there and entered a village (from behind the temple) and proceed to Dhangarwadi. 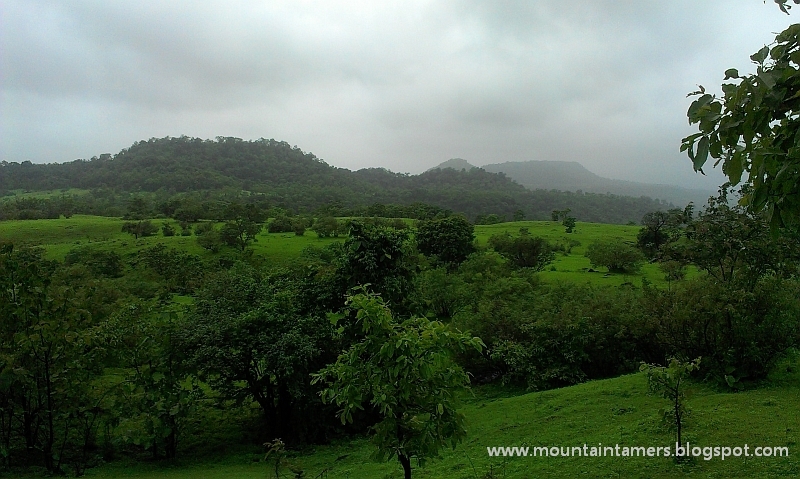 This route has a full green cover throughout, till the route from katarwadi meets this one. 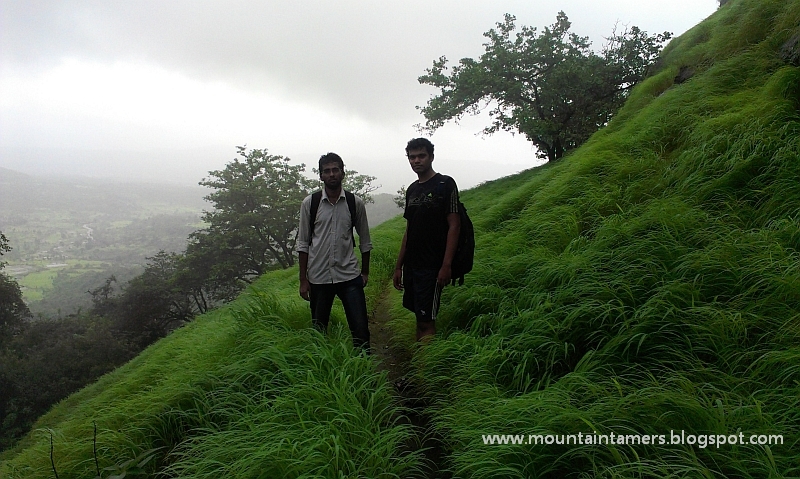 So we started walking at 9.00 AM from Washivali village and reached Dhangarwadi at 10.15 AM. Dhangarwadi lies a few steps away from main route to Manikgad Fort. This is the last shelter and there are no houses nor huts after this point. Tip: No need to go all the way to Vadgaon village. This saved a lot of our time. People with cars usually go till Vadgaon village. We travel by state transport, and if you are also planning to visit by a state transport or similar, then I would recommend you to start your hike from Washivali village. Its easy, safe and you will meet people on the way. Just ask for way to Killa (fort) and the villager will point out to you. 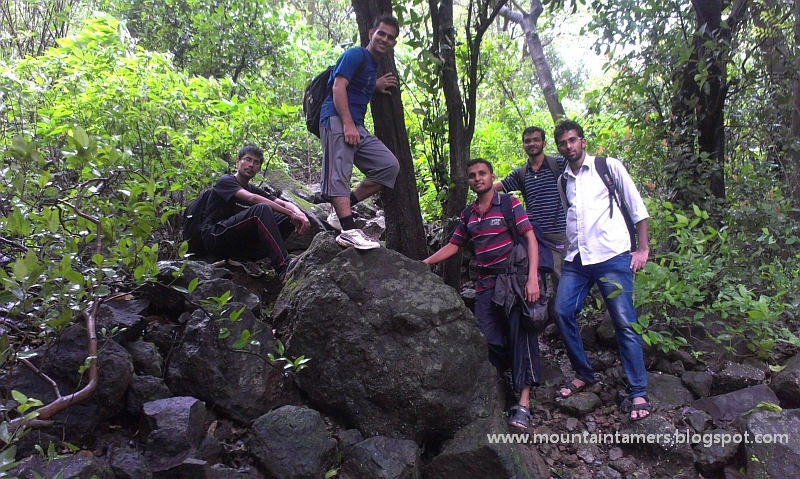 The next level of the trek was the long & tiring traverse till the Hanuman temple. The route till this location was a straight forward, but the places near waterfall had completely gobbled-up the route and hence left us on a wild goose chase. 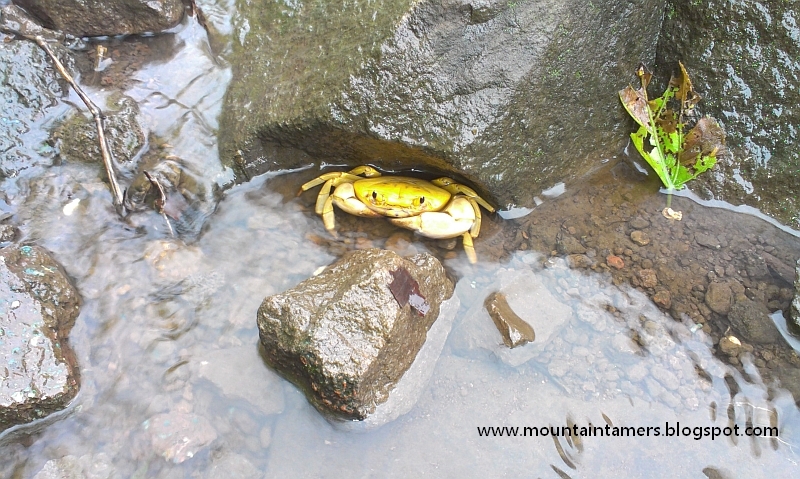 Every time we encountered a small waterfall, the route following it had disappeared, eaten up by huge boulders. So, many times we found ourselves lost amidst thick forest, with no route visible ahead of us but only thorny bushes and irksome mosquitoes. But thanks to our team work, we were able to bring the horses back on the track. Somehow we managed to reach the Hanuman temple and started walking straight ahead. And this is where we made our first mistake, the mistake of the day, which costed us our precious 45 minutes. We were carrying this (stupid) map and were navigating the route exactly as it was drawn there. Now, what map said was to continue traversing after the Hanuman temple and then after about 20 minutes the climb starts (this is what map told us). So we did, and walked and walked and walked. We knew we were lost. Because there was no route at all. It seems we were making our own route. 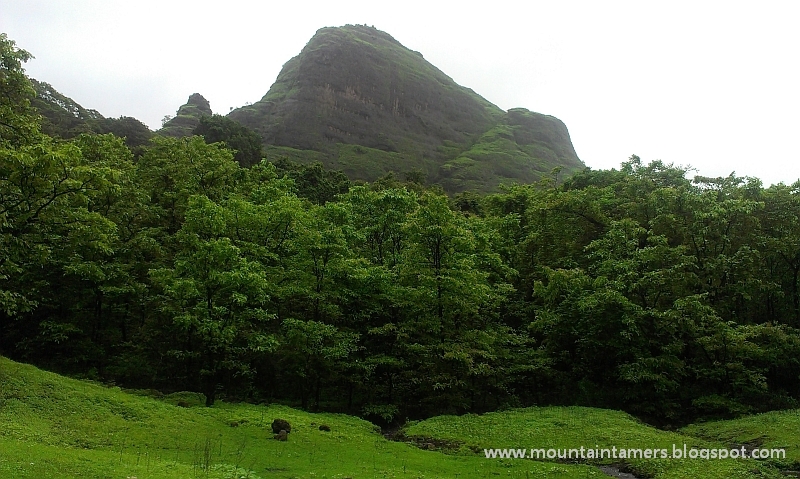 We were so very much lost, that we could easily make out that we were heading to Mashyachi Khind (माश्याची खिंड), the col between the Manikgad valley, while the route to the top should be heading to our left. We were walking continuously for 3 hours straight, without even resting for a bit. We got lost in the forest, took a wrong turn to get diverted from our path, spent some of our precious time to get on the correct route and what not. We decided to reach the Hanuman (हनुमान) temple for analyzing our further course of actions. No one was able to think clearly. Suresh was the first amongst us to panic, he had enough of all this and wanted to start the descent right away. It was a frustrating as well as disappointing moment for all eight of us. Disappointing, because we had trekked for three hours, continuously, without resting. Frustrating, because the fort was still envelope by thick fog and was still not visible. What was the point of walking ahead if the goal is not in sight ahead? I mean, how could this happen? We were following the map exactly as it was. We had came this far and so, we were determined to reach the top. But how? Ninad and Bhavesh were busy contemplating on the possible errors we might have committed; Tarun, Abhash, Manoj and Atul were enjoying the merry mellifluous sound of the water stream, while Suresh were resting, too frustrated to think of anything. The Miasma of despair had started rising. I was afraid of the worst, what if we can't find our way to the top? Ready to roll again !!! And just when we were about to forfeit our plans to ascend the fort, two dogs came hopping out of nowhere with their masters following them. And pointing towards them, Tarun gave a sudden jolt of joy and shouted, "lets ask them". They were the local villagers from Katarwadi, who had come hunting in the forest. We approached the one in the front and explained our situation to him. We persuaded a villagers to show us the way and he gave us a positive nod. Now we were on our feet, ready to roll again. Now Suresh, Atul and Manoj too geared up, thanks to some gentle coaxing from Abhash. It was 12.00 PM then. After walking for about a minute, we came to the spot where the route manifolds into three different paths (earlier, from where we had taken the one to the right, only to find ourselves amidst thick forest, having lost our way). The villager told us that the correct route was to take a left turn, instead of right. He took us till the turn and ask to follow that route. We were on the correct track again and highly delighted at the same time. The trek to the top was a gradual climb, but comparatively easy and was accomplished in 40 minutes (again, without resting). The bliss experienced by the adjacent valley, Mashyachi khind was indeed a moment to savor. The route followed under the thick cover of the forest, all the way to the top of the fort. Well, the fort was not actually a fort, it was more like a vestige of a few standing structures. The first door to the fort (महा दरवाझा) was completely destroyed. The second door, was atleast, looking like a door, and had a sculpture of lord Ganesha (गणेश) inscribed on it. There are more than four water tanks, two on the way, and the rest on the top, with the one tank resembling the size of a huge swimming pool. There was a small temple on the top, unfortunately, with no deity inside. The God/Goddess idol was probably stolen by invaders. Beside the temple, there was a (चुन्याचा घाणा). We spent like 45 minutes on the top. We had our lunch while enjoying the fog. The clouds had completely blocked the visibility, so we were unable to enjoy the valley, but we enjoyed the thrill of having our lunch on the very edge of the fort. Now that we had accomplished our purpose of coming here, we had all the time in the world to start the descend. After the prolonged photo session, we started the climb down at 2.00 PM. When we were midway near the Mashyachi Khind col, the sky had started clearing, exposing the magnificent view of the valley. We even came across two odd groups, probably amateurs, accompanied by a guide from nearby village, while we were navigating the forest patch. They looked enervated and had gloomy faces. They must have had a tough time walking the stretch of 12 Kms. But we were happy we successfully climbed the fort without any guide or something. Now we were heading for a mini-waterfall which we had encountered on our way earlier. We spent complete 30 minutes, 3.15 PM to 3.45 PM, enjoying the moment to the fullest. 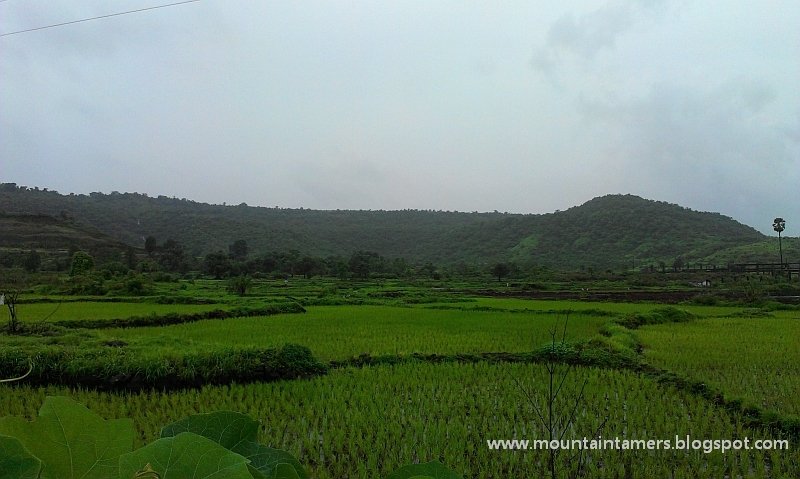 The rain was, as usual, making his intermittent display throughout the trek, which kept us lively at every moment. As we approached the village, we made slight changes in the plan, and decided to progress via Katarwadi village, instead of the route via Dhangarwadi. The route was a bit untidy as it went through the village, but somewhat similar to the earlier route we took. We reached Washivali village at 5.30 PM. We were waiting for the ST bus to arrive, when Atul, Manoj, Suresh were searching for a secondary mode of transport. A TATA Magic guy promised us to drop at Panvel station for 40 ₹ per head. We reached Panvel station, right on time to catch the ~6.30 PM local train. For newbies, I would recommend you take a guide with you (don't rely on any map). This was my second time here and I have almost learnt the route by-heart now. 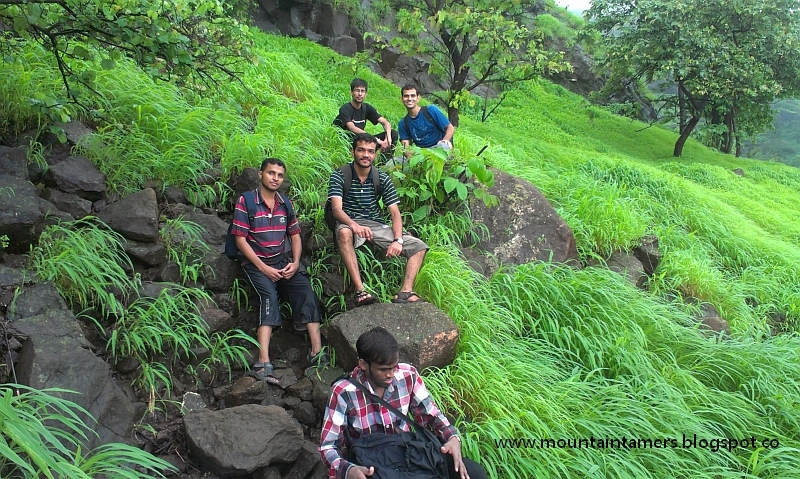 Thanks to Atul Mallya (and his HTC Phone camera), we were able to preserve the Manikgad adventure in the form of photographs. All these snaps were captured from his camera. 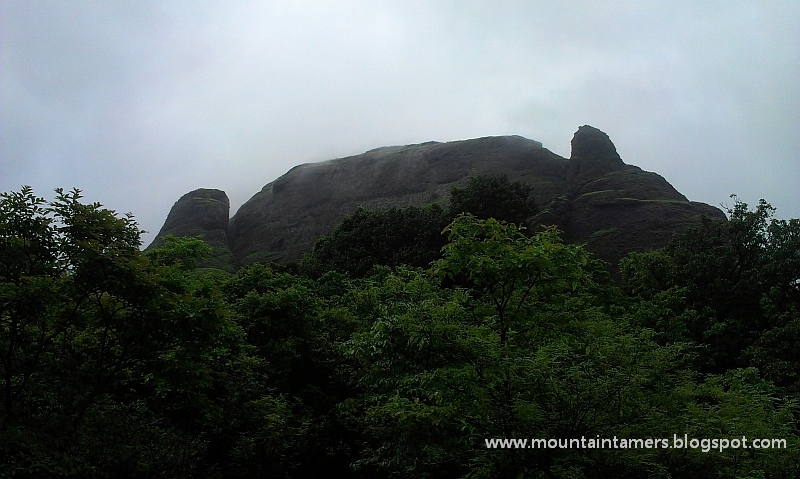 Update: Click here to read my November 2014 visit to Manikgad. Nicely Scripted!!! 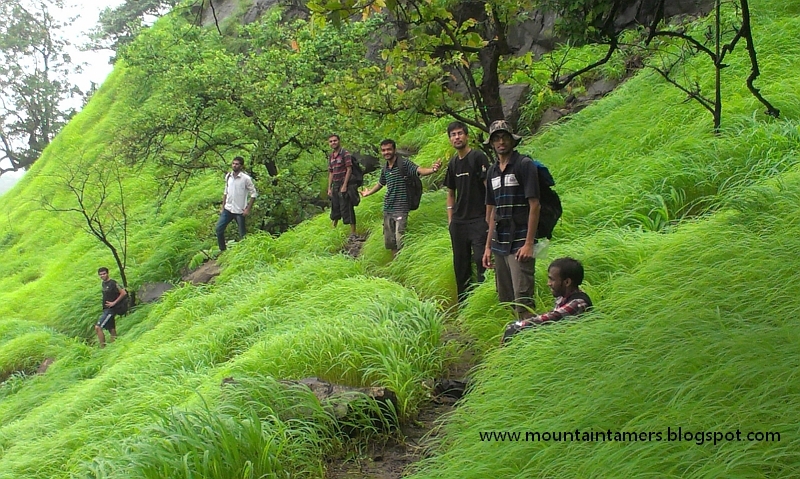 Good information about the trek route!! !